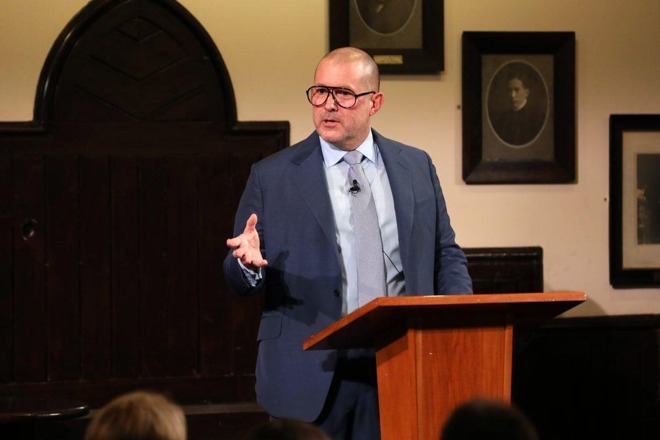 Ideas are extremely fragile but come from a desire to explore, Apple Chief Design Officer Jony Ive told the Cambridge Union Society on Monday, in a lecture after receiving the Stephen Hawking Fellowship from the Society for being one of the "most influential individuals in modern technology." The Hawking Fellowship is an honorary scholarship established last year, months before the death of Steven Hawking in March 2018. The honor identifies distinguished figures in STEM fields and recognizes their contributions to their respective crafts and industries, with Ive being the second person to receive the honor. Delivering the lecture to the Cambridge Union on Monday over the course of an hour, Ive covered a number of subject areas surrounding his work, reports Forbes, but it was all connected together by discussions on the troubles of producing ideas and developing them into full products. "We designers create tools," asserted Ive early in the lecture. "Tools that you can live in, sit on, eat with, tools that enable communication and support learning, creating, and mending. Our tools can be powerful, they can be beautiful, and on many occasions they're not motivated by understood or articulated needs." On the subject of the Mac, Ive notes it has become a very powerful tool for design and creation. "I realized that what you make represents who you are. It stands testament to your values and preoccupations, and using the Mac I sensed a clear and direct connection with the people who actually created the Macintosh." Moving to the design process, Ive believes ideas are fragile "almost by definition," as if they were resolved and robust, they would cease to be ideas, and instead would be shipping products. Ive suggests he's "always taken an enormous delight when the most tentative thought, often from the quietest voice, evolves into significant and substantial products." The creation of the App Store itself stems from the fragile concepts worked on before the launch of the iPhone, such as the production of the multi-touch interface and associated gestures that "not only defined a new natural and intuitive interface" but also "defined an opportunity to create applications with their own unique, very specific interface." "We came to see that we could make applications purposeful, compelling, and intuitive to use," suggested Ive. "And so, as the potential for a vast range of apps became clear, so did the idea for an App Store." Ive also expressed the belief that "being inquisitive, being curious, being open, unites a diverse group of people" when working together, by enabling effective collaboration. "I really have come to believe that common vision and shared purpose is just not enough, but when we genuinely look at a problem it's an opportunity to lean together. We discover something together." Ive ended his lecture by referencing something said by Apple co-founder Steve Jobs about 10 years ago, due to the passage "seeming entirely fitting, mindful of where I am, and why I'm here." The Jobs passage reads: "There's lots of ways to be as a person. People express their deep appreciation in different ways. But one of the ways that I believe people express their appreciation to the rest of humanity is to make something wonderful and put it out there. And you never meet the people, you never shake their hands. You never hear their story or tell yours but somehow, in the act of making something with a great deal of care and love, something is transmitted there. And it's a way of expressing to the rest of our species our deep appreciation." Jony Ive's lecture follows after a number of interviews by the design chief in recent months, discussing just-launched products and other areas. He has previously talked about being proud of the Apple Watch, the design choices behind the new iPad Pro, and has declared he is nowhere close to being done working at Apple.